It hasn’t even been two full seasons yet but Lethbridge Hurricanes star centre Dylan Cozens has a certain it quality to him. Beyond his talent – more than one NHL scout sees a bit of a Ryan Getzlaf in him – the buzz around Cozens stems from his tendency to be the centrepiece of a success story, to say nothing of his own personal background story. Last season, Cozens won the Jim Piggott Memorial Trophy as Western Hockey League Rookie of the Year and was nominated for the Canadian Hockey League award. This season’s fireworks started before it even began, at the 2018 Hlinka Gretzky Cup that was held in Red Deer and Edmonton in August. Cozens scored the game-tying goal in a dramatic finish against the U.S. as time expired. Team Canada eventually won that semi-final in overtime on a goal by Josh Williams of the Medicine Hat Tigers and later beat Sweden for the gold medal. Cozens’ goal was controversial – there was literally no time left on the clock and no video review was in effect to verify it – but whatever the circumstances, it didn’t take away from the clutch performance by Cozens and his team. An example of Cozens being there when good things happen. “To be honest, I never even heard the buzzer I only heard the crowd,” said Cozens, when asked to recount the play that led to his game-tying marker. 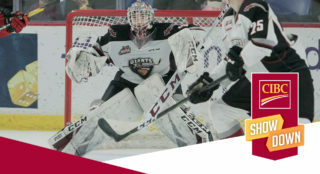 Vancouver Giants defenceman Bowen Byram, part of a defenceman-to-defenceman exchange with Kaedan Korczak of the Kelowna Rockets, fed Cozens the pass. All three players will now suit up again in this year’s game. 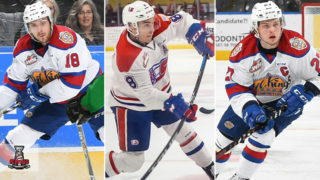 It’s just one example of the bond that has grown with the 2001-born draft class, a group that will form the core of Canada’s entry when the World Junior returns to Alberta in two years. 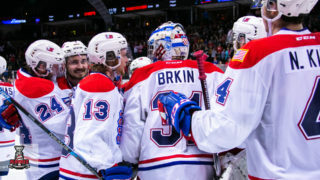 “It was so much fun, it was just a great group of guys,” said Cozens of his time at last summer’s Hlinka-Gretzky event and playing with his cohort of fellow Canadian Hockey Leaguers who dot the roster of this year’s 2019 Sherwin-Williams CHL/NHL Top Prospects Game. Cozens’ background story is notable too. He grew up in Whitehorse, the eldest of three boys born to his father, Mike, and mother, Sue Bogle. Mike Cozens is a judge and Dylan’s mother a lawyer. It goes without saying that education and a general sense of doing one’s best were a central core to his upbringing. But as wonderful as growing up in that unique environment in God’s country was, it put Cozens at a hockey crossroads a few years ago. When it became obvious that their son had elite hockey potential, it became equally apparent he would likely have to move to experience better competition. 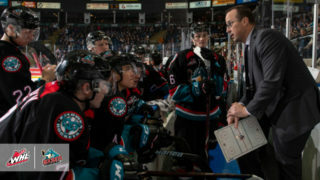 Cozens moved to two different hockey academies in B.C. and was eventually taken by Lethbridge in the first round (19th overall) of the 2016 WHL Bantam Draft. (Younger brother Connor is following the same path). A 12-game, eight-point cameo during the playoffs two years ago foretold the type of player that the Hurricanes had. Shortly after joining the Hurricanes, he was one of Team Canada Red’s best players during the 2017 U-17 Worlds and helped his team to a silver medal. 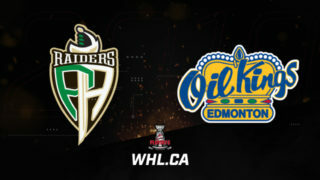 Aside from the vital experience at the U-17, U-18 level and having not yet turned 18, Cozens has already played 28 WHL playoff games (21 points) and passed the 100-point mark for his career before he had even played 90 WHL regular season games. “I just tried to use the confidence I gained from playing last year to get better this season,” he said. 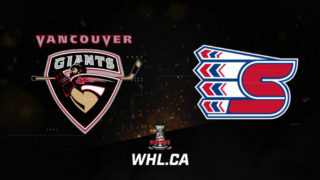 For now, Cozens puts talk about the NHL Draft in its own mental box and is trying to focus on helping the Hurricanes not enter the post-season on a swoon as they did last year, before they bowed out to the eventual WHL champion Swift Current Broncos in the Eastern Conference final. “It’s important that we focus on finishing strong because last season we didn’t play very well our last 10 games or so,” he said. But Cozens will be there. He’s making a habit of it. Written for the Canadian Hockey League by Peter Robinson of Prospects Hockey.